The Catholic League has decided it’s had enough of Burger King and they are calling for a boycott. You know what that means? More burgers for us. Apparently Catholic League President Bill Donohue didn’t appreciate the use of the “c-word,” as he called it, on the Samantha Bee show Full Frontal. Since Burger King ads were playing at the time and were not canceled after his request, he’s taking his beef out on the company. In a statement to the press, Donohue explained his position. The companies honoring the Catholic League’s request include Verizon, Procter and Gamble, Wendy’s, Ashley HomeStore, and the Wonderful Company. 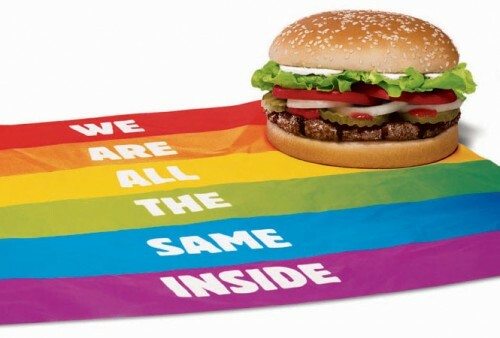 What would he do if he realized Burger King was once home to the”Proud Whopper” during San Francisco Pride? So we know where Burger King stands, but what do Verizon, Procter and Gamble, Wendy’s, Ashley HomeStore, and the Wonderful Company have to say for themselves? Donohue suggested supporters of his organization should try a different restaurant instead of Burger King. “Wendy’s would be a good alternative for those accustomed to going to Burger King – it acted honorably by pulling its ads,” he offered. Oh, how kind and thoughtful of him.